Because. Roster. He doesn't have to be protected. He doesn't have to be protected for this winter. If the Cardinals move him on, they are going to be moving someone else off. Now, there are several reasons for this being part of the equation. One, Hudson could be more appealing to another team if he's not on the roster and not about to burn an option and all of those things matter. 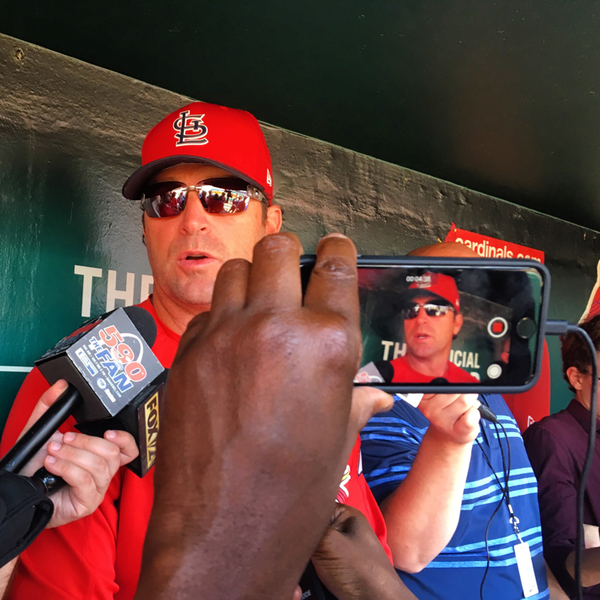 Two, the Cardinals have now three years in a row got in a bind with the 40-man roster and not been able to protect a player they wanted to keep from the Rule 5 draft. Could be that Hudson is too good to ignore too long. Could be. But part of the equation, again, isn't just Hudson. It's who moves out as a result. I get it. Not the answer you want. Not the answer anyone in here apparently is satisfied with. But it is the answer. His performance can change that. Injury can change that. Trades can change that. Do you see the Cards making only one deal or multiple deals before the deadline, and who? They have multiple needs and will pursue multiple deals. They'll look at pitching, and they'll gauge the market for where there might be a bat. Both of these areas are not great around the trade deadline, and the second wild card has even made it less likely for the thunder to move. There will be many, many, many relievers available, because there always is, and if there's a lefty they can get in that kind of move, they'll definitely chase that. Derrick, I understand utilizing data in today's game. Everyone wants the homerun, etc.. Would a team based on speed and defense actually work in today's game? -- Everybody is doing this. -- We should do that differently. That team will win, and the game will cycle in a new direction. The Pittsburgh Pirates, for example, are not striking out all that much at all. It's really remarkable. And it's an interest gambit that they're playing, right. It may work some. As more and more teams prioritize Three True Outcomes and even lean on power at positions over gloves, then the more balls in play the fewer plays those not-true fielders are going to make, right? So, it follows, that a team with that approach could turn the trends against teams. In a small window, it would be like a fire-breathing bullpen with all the modern luxuries of velocity also carrying a funky righty that throws in that 86-88 range with cut and just looks different. We're seeing some of that, too. Run prevention is the goal, however you get there. And some team is going to turn this trend on its head and be better for it. We're already seeing some hitters work their way to the majors or into the draft that are going to defy the shift. Has to happen. If the Cardinals trade for another everyday player at 3B, that would mean a slide to 2B for Carpenter right? In the same or a corresponding move the Cardinals would have to deal one of Garcia, Wong, and Gyorko to eliminate redundancies correct? That is certainly a series of scenarios in play, yes. Is it just me or does anyone else see a number of errors charged to cardinal infielders actually should be attributed to Jose Martinez. His defense is largely responsible for much of the teams poor defensive rankings. Just my opinion! This was definitely the case Sunday in Milwaukee. Thank you for reminding me, because I wanted to check what the rules are with official scorers when it comes to this. I'll do that tonight. Or, if Mike Smith is reading this chat right now, maybe he can chime in with some insight on how an error must be applied. Hello Derrick, Your memes this week were cracking me up! Do you know why Ryan Sherriff has not been added to the DL? He's on the minor-league DL. To be placed on the 60-day DL the 40 has to be full and the team has to be in need of a spot. How would you rank the most encouraging performances from yesterday out of: Holland, Cecil, Fowler, Bader, Weaver? Who will be the Cards lone all-star? They'll get two, it seems. That's the minimum, as of this moment. Derrick, what would we have to give to receive Matt Chapman of the A's? Young 3B prospect, controllable, and has Boras as an agent. Time. Time for him to become a free agent, or two expensive in his arb years to keep. Speaking of which. Going to need some time here to switch venues. Will join you in roughly 20 minutes from the ballpark, if not before. Smattering of answers coming in between, I hope. Then the coverage at the ballpark can really begin. Does Mozeliak really believe this is a good team or is this just company speak to sell more tickets? Keep the bobble heads coming as they will likely be needed in Aug and Sept.
Mozeliak is careful with messaging, for sure. But he gives fans more credit than that -- as if they buy tickets based on his public vote of confidence without checking the standings. That said, his comments recently about being convinced of the quality of this team -- that's the public stance. Don't for a moment confuse that with being content. The front office is not. The front office believes it has put together a team that should be performing better, should be higher in the standings, and if there's not evidence of that happening -- there will be changes. This stance hasn't changed, publicly or privately, since about 11-12 months ago. Could you give some insight on the different verbs that are used in transactions? "Recalled" vs "purchased the contract of" etc. Thanks! Recalled -- Player is on the 40-man roster, has been in the majors before or at least in major-league spring training. Purchased the Contract -- Player was not on the 40-man roster and thus had to be added before being promoted from the minors. The contract-purchasing is the act of putting the player on the 40. Not sure about etc., but here goes. Waivers -- Player passes through a system that allows other teams to take him and put them in a system, or on a roster, depending on the player's previous status. Most waivers work in the opposite order of the standings, by league. Thus, a team like the Yankees would have access to an American League player on waivers before the Cardinals or the Reds or any team in the NL. Outright waivers -- Waivers for the purpose of removing a player from the 40-man roster. Release waivers -- Waivers for the purpose of releasing a player. Designated for Assignment -- One of the above operations is about to take place, but the team wanted time to see if there was another team interested in the player and a trade could be worked out. But in the mean time, the original team wants a free spot on the 40-man roster and needs to move this player off of the 40-man to make it happen. Derrick, when a ML veteran like Holland or Yadi, Waino goes out on a rehab assignment, do they make their own living arrangement or does the team keep a apartment etc for this purpose? They get a hotel room. They don't plan on being there long. Is this team just bailing enough water out to keep from sinking but is their eventual fate sealed? DG I thought last year that the Cardinals might be cautious sellers at the deadline and still improve their record in the second half. Paradoxically I didn't see it as addition by subtraction. We will never know what either buying or selling would have done last year. Is cautious selling but still improving a crazy idea for this year? It is not. This would be something of a Yankees rebuild on the go, and while Cardinals don’t have a Chapman to move for a Torres, there are assets that could move and help a contending team. Not a crazy thing to consider at all based on the standings come, say, July 21. To the earlier question about errors on plays at first base and whether Jose Martinez's performance there is dragging down the other fielders' percentages: This is from Rule 9.12 (a)(1) in the 2018 Official Baseball Rules: "If a throw is low, wide or high, or strikes the ground, and a runner reaches base who otherwise would have been put out by such throw, the official scorer shall charge the player making the throw with an error." Doesn't matter if it looks like a throw that Martinez should have been able to stretch for and get to, or it takes a hop in the dirt and bounces right up to Martinez's mitt but he can't grab it, or it goes high enough that he has to jump just a little bit and then he winds up not hanging onto it ... if the throw is low or wide or high or strikes the ground, and the runner is safe when an otherwise "good" throw would have retired him, the player making the throw always gets the error. It's a scoring rule. So many fans are justifiably loving on Bader. I like him too, but how does he equate to others around the league and even in our own system? Is he a future difference maker or 4th OFer. Girsch offers updates, including Wacha’s absence, which will be as reported at the beginning — a matter of a month or more, not a few weeks. Alright. Let's get back into the stream here. Set up in the press box. Reporting mostly done. Time to dig in for the final stretch. Hi Derrick! Thanks for the Chat as always. Do the Rox have enough payroll muscle to resign Nolan? Good question. Every team has the money, it's whether they have the fortitude to also plan around that spending and the OK from ownership. It's the latter part that I don't know about from the Rockies. But, yes, on face value, they have the ability to make a competitive offer and keep Arenado, and may just do so unless he zooms to the West Coast to play for the Dodgers.